In a recent interview with GQ UK, Benedict Cumberbatch implied that Season 4 of Sherlock might be the last. It’s not surprising, but it’s a damn shame. According to Deadline, the show has not been renewed beyond Season 4. 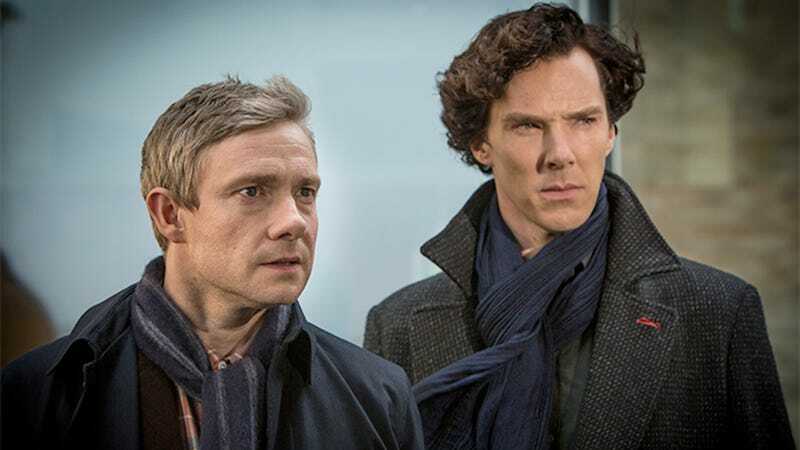 And when Sherlock co-creators Steven Moffat and Mark Gatis appeared at San Diego’s Comic-Con in July, they made no promises that it would be renewed for a fifth. They did, however, remark that this upcoming season will be exceedingly dark. I think many of us concur with that last sentiment, B. But it’s become clear that both Cumberbatch and co-star Martin Freeman have struggled to incorporate the show into their increasingly busy schedules. It’s especially wonderful to see Freeman receiving such well-deserved notice. The role of Watson is by no means flashy; on the contrary, it’s in many ways thankless. But Freeman’s straight man approach, and the heart with which he approaches his friendship with Sherlock, has transformed the role into the show’s lynchpin. And of course, his chemistry with Cumberbatch is unparalleled. Now I’m depressed! Ah well, we still have a fourth season ahead, scheduled for 2017 on BBC and PBS. Maybe we’ll be in less of a hurry for its release now.